Over the years there have been a lot of different anime and manga that are themed around over the top school clubs. Girls und Panzer had school girls driving around tanks, and Gainax’s Stella Women’s Academy, High School Division Class C3 had school girls engaging in survival games with BB and airsoft guns. 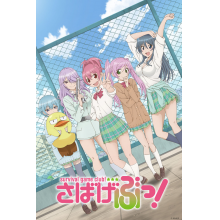 Surprisingly C3 isn’t the only anime about high school girls and survival games, as last summer Pierrot+ produced an adaptation of Sabagebu! Rather than going for a coherent storyline, Sabagebu! follows a comedy format that has several skits per episode. While there are some moments where the jokes fall flat or the skits decide to go for a more serious tone without having characters that can pull it off, the pure insanity and lighthearted tone results in quite a few laughs and makes this a fun viewing. The series begins with Momoka Sonokawa on the train to head to her first day at a new high school. She’s had to transfer schools quite a bit, and despite having a bit of a greedy and vengeful personality she tends to disguise herself as a kind and nice person. Momoka finds herself facing a train molester on the way to school, but before she can take action a mysterious girl rescues her by pointing what looks like real Desert Eagles at her attacker. After discovering that this girl also attends her new school, Momoka follows her and walks headlong into a trap in the woods. At this point she discovers the girl in question is Miou Ootori, the president of the Survival Game Club, and is recruited against her will to become a member. The other members are Maya Kyōdō, Urara Kasugano, Kayo Gōtokuji, and a platypus named Platy that serves as the club’s mascot. Like most comedy themed anime, the main cast is a ragtag bunch and each has their own quirks that the skits play off of for laughs. Momoka initially seems like the most normal, but her obsession with money and need to try and get revenge whenever she feels wronged or threatened leads to some hilarious moments. There are quite a few moments where her personality reminded me of Sakura from Binbougami-Ga!, as she has the same tendency to completely abandon her friends in favor of saving her own skin and can be downright mean to some of them at times. This type of confident, take no prisoners lead works well in both series, and in Sabagebu! it fits the outlandish survival games perfectly. The other members have just as many quirks, as Maya is a gravure model who seems out of place for a club of this type and has a running gag where she’s usually the first to get shot/die in one of the games. Miou is the fearless leader and is part of a wealthy family, so she has a tendency to send in helicopters and has a pet lion. Urara has a bit of an obsessive personality and is initially infatuated with Miou, but after an alteraction with Momoka early on she becomes completely masochistic and head over heels in love with her. The last member of the main cast is Kayo, who doesn’t really care that much about the actual survival games but is an avid cosplayer and tends to wear completely silly outfits. Each of these quirks makes Sabagebu! distinguishable from some of the other comedy anime out there, and it’s always nice to see another series aimed around humor that doesn’t seem to be using the standard school tropes for all of the jokes. Part of what makes a lot of the jokes about survival games work so well is the way that the battles are portrayed, as they are animated to look like real gun fights. This means that whenever someone gets shot they’re shown bleeding or actually falling to the ground dead, much like what the participants are imagining in their head. The show’s narrator goes out of his way to explain each time this occurs that it isn’t real and the gun fights are exaggerations based on what the characters are imagining, and while it was funny the first few times it becomes a bit of annoyance to have it re-explained in every single episode. But aside from this minor issue, the fact that the survival game scenes are animated to look like actual gunfights adds to the humor and allows the skits to be as over the top as they possibly can. There are plenty of great scenes in here, especially when the club battles a middle school Survival Game Club or a bunch of elderly survival game enthusiasts, as the results often involve lots of explosions. Despite being themed around a survival game club, there are quite a few skits that aren’t themed around the actual games and has the girls in the club going about other daily events. There are skits where one of them might find themselves in an embarrassing situation in school, or encounter some crazy event in-town. Even when these situations occur the girls usually get themselves out of whatever is happening with their guns, often leading to some hilarious results. The majority of the humor in Sabagebu! is of the slapstick variety, with a good deal of character gags thrown in for good measure. I don’t want to spoil too many specifics, because much of the appeal comes from how well each episode nails its timing. It isn’t uncommon for a skit to throw one gag after another, and the rapid fire delivery manages to remain fresh without becoming too repetitive over the 12 episodes. If you go into this one expecting the same type of emphasis on actual survival games as C3 you may be disappointed though, as the focus is more on the humorous interplay between the members of the main cast, with the guns and survival games acting as a medium for the jokes. Any scene featuring otaku Fried Chicken Lemon (yes, that’s the actual name they give him) is guaranteed to warrant laughter, particularly when he sacrifices himself for Momoka unintentionally. While Sabagebu! gets off to a fantastic start and does a great job balancing its silly over the top slapstick comedy with bloody gunfights and quirky character gags, there are some areas where it stumbles. Just like with Binbougami-Ga!, whenever the series decides it wants to head into serious territory it falls flat. This doesn’t happen that frequently, but there are a few skits where the writers decided they wanted to go for a slightly more serious, emotional moment in between the comedic moments. However, these moments tend to drag and don’t quite have the impact that was intended because the cast can’t support them. There are a few instances where Momoka learns some kind of life lesson or experiences a more serious moment, but these moments clash with how she acts during the rest of the series and aren’t quite as convincing. I have yet to find that many comedy themed anime that can pull off these serious transitions that well, and because the character personalities aren’t often developed beyond the gag level this is once again the case here. Sabagebu! also does have a few jokes in the later episodes that don’t always hit their target, but the amount of times that it will make you laugh makes it worth sticking with. Pierrot+ seems to be a relatively new branch of Studio Pierrot, and up to this point their main output has been the anime adaptation of Beelzebub. One of the first things I noticed about Sabagebu! was that it has a very traditional look to it, as everything is bright and colorful and the overall aesthetic has that familiar school life anime comedy vibe. But despite this familiarity, the series is able to use this look to its advantage. Despite the bright and cheerful feel of the animation, there is a decent amount of blood during the gunfights and over-exaggerated reactions during the slapstick scenes. It’s clear that the animation team wanted everything to be as over the top as possible, and the combination of the brighter look with grittier shootouts is used in a comedic fashion that makes Sabagebu! distinguishable. Whenever the girls draw their guns they go through a transformation sequence that seems to be parodying Sailor Moon a bit, and while this is amusing it happens in every episode with no visible changes which does lead to some repetition. In between gun fights there is plenty of slap stick visual gags and exaggerated facial reactions, and while this is nothing new for anime of this type the consistent visual quality and rapid cuts between comedic elements works well. Both the opening and ending themes fit the overall feel of Sabagebu!, but neither tune managed to get stuck in my head in the same way that a lot of other anime songs out there have. In particular, the opening seems a little too mellow and laid back for a series that is this over the top with its comedy and action, as it gives the impression that the skits might head in a different direction than they actually do. I’m a little more partial to the ending song, which is sung by the four main voice actresses, as it’s a bit quirkier and fits the tone better. The same is true of the background music, but it’s not that big of an issue for a comedy. What’s important in a comedy is how well the voice actors can deliver their lines, and this is where the series comes through. Each of the four voice actresses is able to do a great job selling their characters, with my two favorites being Rumi Ōkubo (Urara) and Yumi Uchiyama (Miou). Rumi’s performance is particularly noteworthy because she’s able to represent Urara as extremely girly and freakishly strong (via a much lower pitch) from one scene to the next and the amount of energy she brings to each line works perfectly. It’s not that far off from her role as Chinatsu in YuruYuri, and fans of that anime will likely notice a lot of similarities. The other actresses and actors are able to sell the gags as well, and as a whole the voiceover work is as silly as possible which is a great thing. How much you enjoy Sabagebu! will depend on what type of anime you expect going in. If you’re expecting another Stella Women’s Academy, High School Division Class C3 you may come away a bit disappointed, as this series goes in a very different direction. Rather than making the airsoft/BB guns or survival games the primary focus, it uses these elements as a means for comedic situations and over the top silliness with plenty of the traditional slapstick and character gags in between. Although some of the jokes fall flat and whenever Sabagebu! goes for a more serious moment it doesn’t quite work, there are still plenty of memorable gags that will have you laughing for quite some time. There may be quite a few silly anime comedies fighting for your attention, but the combination of outlandish gunfights and slapstick action makes this particular series one I think viewers will still remember in the coming years.